What’s all this about anti-Semitism in the Women’s March? Rosalind Petchesky, MacArthur fellow, socialist-feminist scholar and activist with Jewish Voice for Peace, questions why accusations made nine months ago are suddenly hitting the mainstream media just weeks before the third national Women’s Marches are scheduled to step off. Petchesky’s Appeal to Jewish Women to Support the 2019 Women’s March and Its Leaders has been viewed over 15,000 times and shared widely on social media. 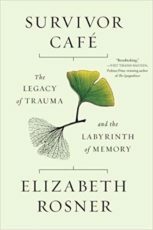 Tune in for a wide-ranging conversation with Kate Raphael and Elizabeth Rosner, author of Survivor Cafe: The Legacy of Trauma and the Labyrinth of Memory, about writing, teaching and dealing with intergenerational traumas experienced by many people across the globe.